There has never been a multifunction product like the MC860 MFP. Never before has a fast, wide-format color MFP been so affordable. Never before has a networked tabloid color MFP had such a remarkably small footprint. The MC860 MFP from OKI Printing Solutions is a ground-breaking combinationand a giant step forward in wide-format printing, copying, scanning and faxing for your business. Introducing a major breakthrough in cost savings and performance Now you can enjoy the benefits of wide-format color whenever it's needed, at a price on par with letter/legal multifunction devices. The excellent print-and-copy quality of the MC860 MFP is delivered even on ordinary office paperno special media are required helping to control costs while producing breathtaking output. Scan pages up to tabloid-size and send digital files to multiple destinations The MC860 MFP features a tabloid-capable scanner with a reversing automatic document feeder (RADF) that scans both sides of a document. Using the large LCD operator panel, you can easily send your scan to a PC, a folder on the network, or to a USB memory device. Or transmit it along with a fax or attach it to an e-mail message. Print, copy, scan and fax in a wide range of document sizes and formats with ease Letter- and legal-size sheets for day-to-day requirements, and tabloid sheets when the task demands it. Produce spreadsheets, newsletters, posters, booklets, postcards, even banners up to 4 feet in lengthall in-house. With Single Pass Color Digital LED technology, the MC860 MFP's straight paper path easily handles media up to 203 gsm (110 lb. index), envelopes and banners. 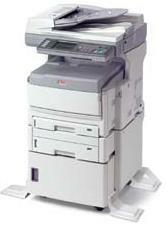 And the standard duplex printing/copying capability of the MC860 MFP saves time and supplies. Fast throughput to enhance efficiency With print and copy speeds of up to 26 ppm in color, 33 ppm in monochrome, and a time to first color page of 9.5 seconds,1 the MC860 MFP keeps your work flowing productively. The MC860 MFP has full networking capability out of the box plus high-speed USB 2.0 and parallel connectivity, so its fast print/copy speeds and magnificent output are available to workgroups and individuals. It also offers enhanced document security, ensuring peace of mind for your company, customers and employees. Count on the MC860 MFP to produce a wide range of documents on a variety of paper weights and sizes. Single Pass Color technology and a straight-through paper path allow for faster color and mono print speeds, minimal paper jams, smooth handling, and exceptional color outputeven on specialty media. The scanner on the MC860 MFP also allows users to copy mixed-size originals. Take control of your color output, document safeguards, and bottom line: the MC860 MFP from OKI Printing Solutions delivers breathtaking prints and copies, enhanced security features, and budget-protecting software. Unique HD (High Definition) Color technology For print quality that visibly enhances your documents, HD Color technology combines OKI Printing Solutions multilevel LED printheads and unique microfine toner with 1200 x 600 dpi resolution to provide greater depth of detail and color, and a high gloss finish, even on ordinary office paper. Print banners up to 11.6" x 47.24"
We ship all "OVERSIZED" freight items with "Commercial Trucking Lines" for Safe & Secure Transport. The "Trucking Company" will make your delivery at "Curb-Side" only! If you require delivery indoors, please check "LIFT GATE WITH INDOOR-DELIVERY SERVICE".